Bread pudding is one of my favorite comfort desserts -- especially if it's topped with a creamy whiskey-laced sauce. I first learned to make bread pudding as a young woman, because it's one of Michael's favorites too! Over the years, I've made bread pudding from traditional French bread...croissants...and even doughnuts once. However, I recently came up with a great new version that features Italian panettone. If you've never had panettone, it's a cross between a sweet bread and a cake. I recently received a large penettone from Bauli that's a recipe from Milan featuring two kinds of raisins and candied orange peel. When I first tasted it, I just knew that it would be perfect for making a bread pudding! 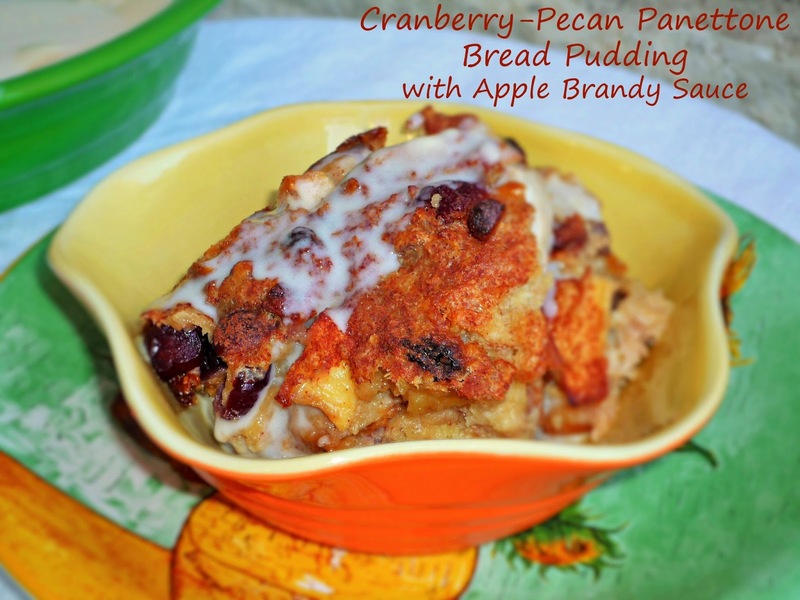 I added some dried cranberries soaked in apple brandy, apples, pecans, and cinnamon to make an off-the-charts bread pudding. Rather than my usual whiskey sauce, I decided to make a creamy apple brandy sauce instead. The end result was magical! Step 1: Add the dried cranberries and apple brandy to a small bowl; microwave for 1-2 minutes to plump. Add the panettone cubes, pecans, and plumped cranberries -- including any apple brandy left in the bowl. Add the eggs, half and half, sugar, and cinnamon to a large measuring cup. Whisk well until combined. Pour the custard over the ingredients in the bowl and stir until well combined and the custard is absorbed. Pour the mixture into a buttered casserole dish or 13x9 pan. Step 2: Heat oven to 375. Bake the bread pudding, covered, for 45 minutes. Remove the cover and bake an additional 30 minutes, until golden brown on top. To make the apple brandy sauce, add the half and half, sugar, and vanilla to a large non-stick saucepan over medium heat. Cook until the mixture is just below a boil. Add the flour-apple brandy slurry and whisk well to combine. Bring to a full boil and cook 2 minutes, stirring constantly. The sauce is ready when it coats the back of a spoon and a finger run through remains. Step 3: Let the creamy sauce cool for about 10 minutes -- then add the remaining 1/3 cup of apple brandy. To serve, spoon the bread pudding into individual serving dishes and top with the warm apple brandy sauce. This bread pudding is one of my best versions yet! 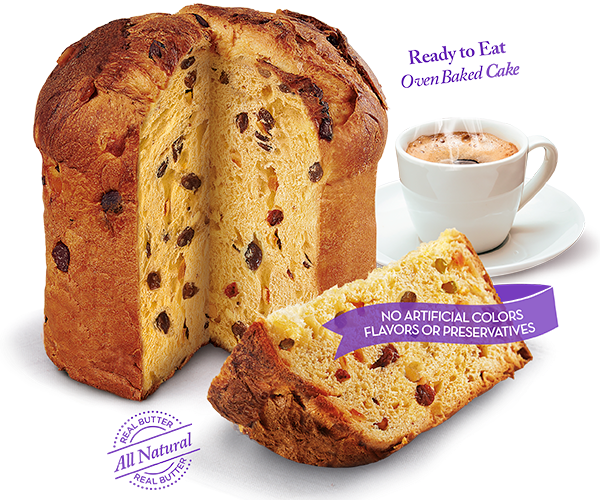 The combination of apples and dried cranberries worked perfectly with the raisins and candied orange peel in the panettone -- the overall effect was a warm citrus flavor. The sweet and creamy apple brandy sauce had just the right amount of kick from the brandy. Put it all together and this is a perfect homey dessert...or addition to a weekend brunch. This one got two big thumbs-up from everyone who tried it, so I hope you'll give it a try soon.